Likutei Moharan, "Pure essays from the renowned and pious… R. Nachman, grandson of the Baal Shem Tov". Ostroh: Shmuel son of Yissachar Ber Segal, . First edition. Likutei Moharan (acronym of "our master and teacher, the rabbi R. Nachman"), the chief book of R. Nachman of Breslov (Bratslav), is the primary work of the Breslov Chassidism doctrine, with considerable influence on Chassidic Jewry until this day. This book is the first edition, consisting of the first part of the composition. This is the only book of R. Nachman's teachings printed during his lifetime and under his directives. After R. Nachman's passing, R. Natan published a second part named Likutei Moharan Tinyana. The book was edited by R. Nachman's foremost disciple – R. Natan Sternhartz of Nemirov (Nemyriv), known as Moharnat, based on booklets containing the teachings of R. Nachman which R. Natan (and his colleagues) recorded during his lectures. The editing was done at the behest of R. Nachman and under his directives. While R. Natan was engaged in binding the manuscript composition, R. Nachman reputedly told him that although he probably thinks he is dealing with something inconsequential, several worlds actually depend on the binding of this book. R. Nachman considered the printing and study of the book as Atchalta D'Geulah – beginning of the Redemption (Chayei Moharan, 346). He expressed effusive praise for his book and its power to confer holiness and purity to whoever studies it, saying amongst others that the book can grant a person superior intellect, since it contains exceptional and profound wisdom, and that studying the book could influence a person to complete repentance (Chayei Moharan, 347, 349). He informed his disciple R. Natan: "You know a little of, but more so should you believe in the magnitude of this book's greatness and holiness" (Chayei Moharan, 369).R. Nachman also described the great importance of buying this book, asserting that every person should endeavor to purchase the book, and that anyone who could not afford it, should sell the pillow from under his head to buy the book (Chayei Moharan, 349). He prophesized that it the future, the book would be in high demand and reprinted many times over (ibid.). Furthermore, R. Nachman declared that just having his book in the house is very beneficial for the protection of the house and possessions (referring to Likutei Moharan, the only book printed in his lifetime) and he actually urged wealthy people to buy his book as a safeguard for their fortune (Chayei Moharan, 355). This book earned approbations from the leading righteous men of the generation, yet in his modesty, R. Nachman did not wish to publish them (see R. Natan's preface to the book). These approbations from the Chozeh of Lublin, the Maggid of Kozhnitz and R. Avraham Chaim of Zelechov, were printed in later editions, and include effusive descriptions of R. Nachman's greatness and holiness. 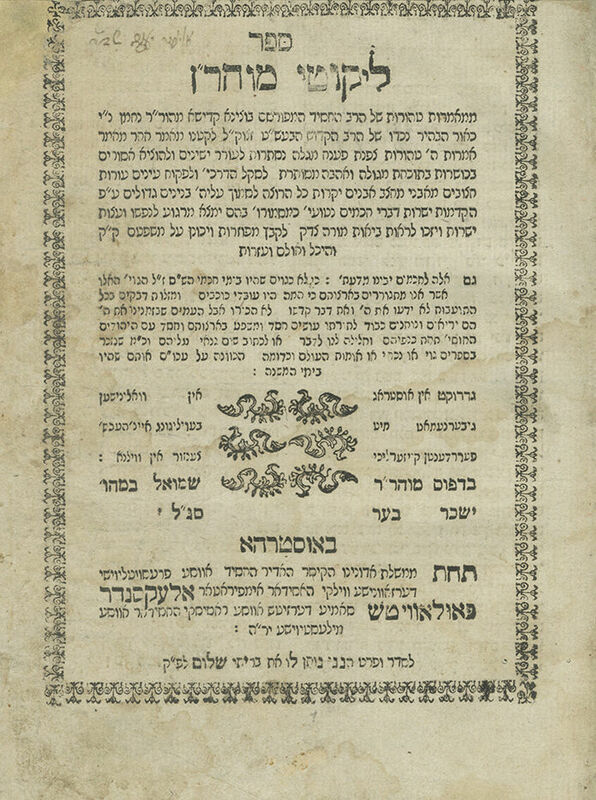 Signature on the title page: "Eliezer Yaakov Shadar" [see item 101]. Brief gloss on p. 115a: "See Pardes Rimonim… and it will completely resolve the difficulty". Complete copy. , 160 [i.e. 162] leaves. 20 cm. Condition varies; most leaves in good condition, several leaves in fair condition. Stains. Dampstains and dampness damage to several leaves. Worming to title page, and worming (repaired) in several other places. Tears and damage to title page, slightly affecting text, professionally restored. Tears and damage to margins of several other leaves (mostly first and last leaves), professionally restored. Leaves trimmed close to text, slightly affecting title border and heading of other leaves. New, elegant leather binding.